When it’s time to share a sweet treat with a special someone, you might be left scrambling for something to make, especially if you’ve waited until the last minute. Don’t worry! 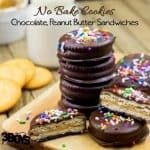 These no bake chocolate peanut butter sandwich cookies can make a great gift for your Valentine or yummy Valentine’s Day party snacks! With this easy recipe, you just start with crackers and build a fast masterpiece! Plus, you don’t have to bake a single thing. Win! If you’re looking for more easy cookie recipes, stop by and learn how to make my easy peanut butter cookies and these 5 ingredient chocolate chip cookies! Even though this recipe is simple, you still have room to experiment a bit. If you don’t like Ritz crackers, try Town House or even vanilla wafers if you want something a tiny bit sweeter. Swap out peanut butter for almond butter or cashew butter. Or you can use chunky peanut butter to make your cookies a bit “crunchier”. Substitute dark chocolate for milk chocolate candy or use white chocolate for a beautiful wintry treat! Make sandwiches by spreading peanut butter on each cracker and topping with another cracker. Melt coating according to package directions; remove from heat. Dip each sandwich into the coating and make sure it's thoroughly covered. Place on a wax paper-covered cookie sheet (if using sprinkles, add them now) and refrigerate for 10 minutes. Once you’re finished with the cookies, let them sit out for a while until the chocolate has completely hardened. Afterward, you can keep them at room temperature or store them in the refrigerator until you’re ready to gift them or eat them. When you’re ready to bake these yourself, use these Amazon affiliate resources to make it a piece of cake! Hello,Love the concept of sandwiching two biscuits with peanut butter. These make perfect gifts as well. Those look so good. 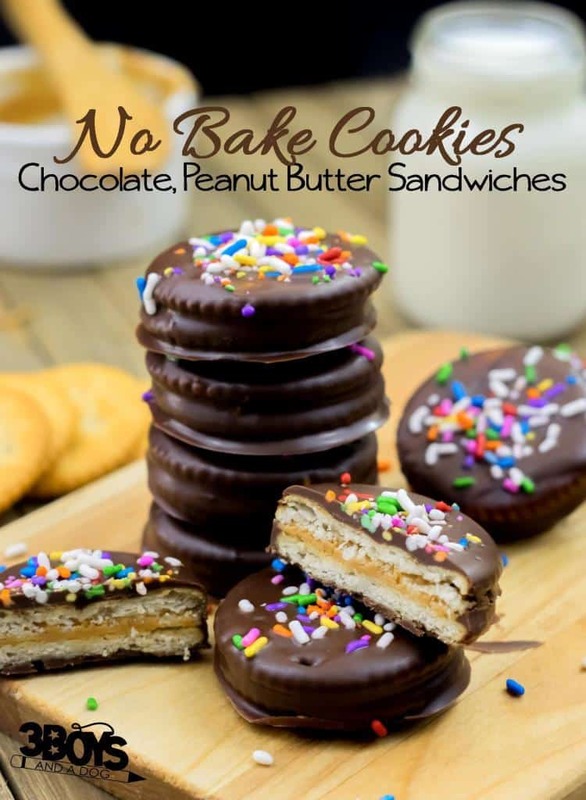 Love the idea of salty Ritz crackers with the chocolate. What a delightful recipe and so easy as well. I can seeing using different cookies or crackers. Thanks for sharing at DI&DI. I’ve made something similar, they are soo tasty!! That’s such a cool idea. 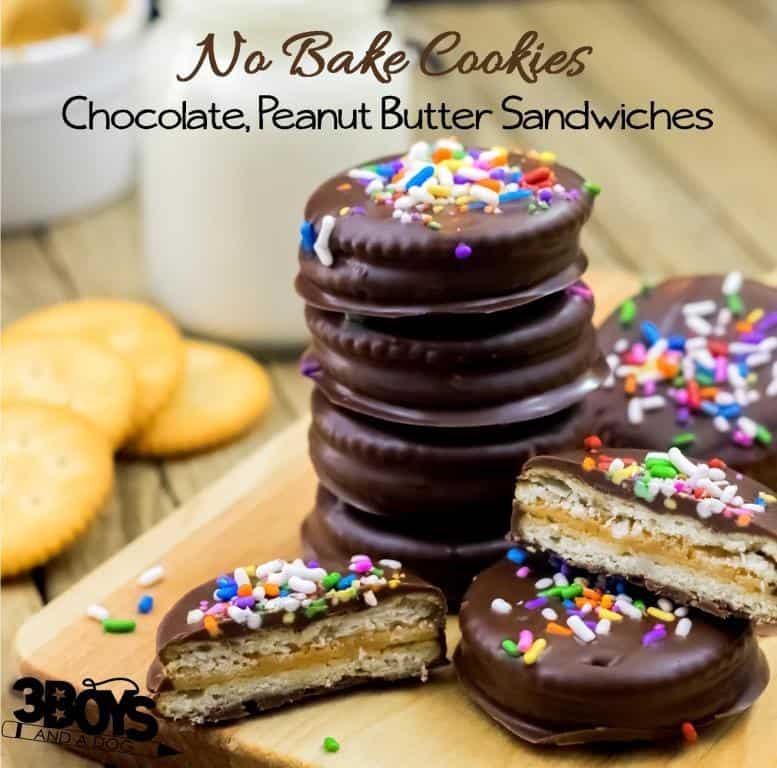 Love the concept of sandwiching two biscuits with peanut butter. These make perfect gifts as well. Looks deliciously easy! Thanks for sharing at the What’s for Dinner link up! I don’t eat dessert anymore but love to make things for my husband to take to work. Pinning. these. I just love to give and receive a a homemade gift, these are great ideas. Hope you have a fantastic week and thank you so much for sharing with Full Plate Thursday. Yum! My family would love these and I love that they are easy to make!